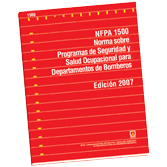 Prepare fire fighters to safely control the hazards they face with the revised Spanish edition of NFPA 1500. Access the latest performance requirements for every aspect of health and safety in career, volunteer, private, and military fire departments in the Spanish NFPA 1500: Standard on Fire Department Occupational Safety and Health Program. This essential document provides the protocols required for everything from fire fighter training, vehicles, and tools to emergency operations, incident stress, and protective clothing and equipment. Keep fire fighters safe in a high-risk profession.